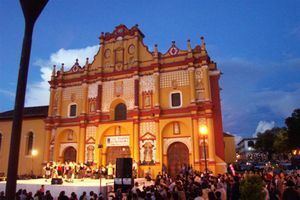 San Cristóbal de las Casas is in the southern Mexican region of Chiapas. Most colectivos arrive and depart next to the ADO bus terminal, south of the city center. The express bus system for getting around Mexico is advanced. The buses are generally comfortable and clean and there are multiple lines to choose from in a user-friendly way with professional and helpful ticket clerks at most main stations. The roads to San Cristóbal are winding and can be dizzying so some choose the option to take a bus and let a professional driver do the work. You can see the beautiful greenery of Chiapas all around you on the trip through the big bus windows, or pull the curtain to nap. There is a road to San Cristóbal and it takes about 35 minutes to get from Tuxtla Gutierrez to San Cristóbal and is not so vertiginous as the old road. There is also an airport that is one hour 15 minutes from San Cristóbal and as of spring, the fare for a taxi is 700 pesos per taxi to San Cristóbal and 250 pesos to Tuxtla Gutierrez, or a shuttle service offering door-to-door service for 200 pesos to/from San Cristóbal. From Tuxtla one can take an "Omnibus" that leaves every 20 minutes to San Cristóbal for about 40 pesos. There are many other public transportation modes from Tuxtla to San Cristóbal: taxi colectivo, autobus, and collective suburbans. The taxi drivers all know where these are located. San Cristóbal de las Casas is a beautiful city. If you are reasonably mobile you should be able to walk anywhere within the city without strain. Rent-a-Bikes are also a good way to get around if you have a very "adventurous" side! If you rather make your own plans and travel a bit off the beaten track, rent a car with driver.. Or, alternatively, if you are comfortable with a) your Spanish, and b) travelling in a tightly packed van or truck, hop in a colectivo--essentially an informal taxi. You can spot these travelling in and out of the city quite frequently, and cost a fraction of a car rental with driver. Taxis - Taxis are all over the place (a little too many of them, honestly) and easy to flag down. Taxis cost between 25-30 pesos and go up about 4 pesos in price after 10PM. A good option if you are in a hurry or just tired from walking around all day. Ask the price before getting in to make sure that you get the going rate. Rates for going to the airport from San Cristóbal to Ángel Albino Corzo is 400 pesos and will pick you up at your place of stay as early as needed. Return taxis to San Cristóbal are 500 pesos (600 on Sunday). Taxis are also available for hire, depending on where you want to go and for how long. Prices should be negoitable. This may be a good option if you want to do a trip on your own to El Arcotete or Rancho Nuevo, even to San Juan Chamula. Colectivos - The main form of public transportation for locals come in the form of a van or small bus. The cost is 6 pesos. Be prepared for a cramped ride and frequent stops but hey, that´s just part of the fun. prices for public transportation in the form of Taxis or Colectivos are subject to change on a yearly basis. Maya Medicine Museum is not to be missed. Information is available in English and Spanish and they also have healers on site to treat whatever ailment you may suffer. Good views of the city and surrounding mountains can be had from the churches on hills on the east and west sides of town. There is a drum and brass band and singers who perform patriotic melodies at 8AM Mondays at the main square. Musicians may be found at the square evenings as well. Na Bolom, former home of Gertrudis Duby Blom, Swiss wife of Danish archeologist Frans Blom, continues to be an inn and museum managed by her supporters and associates. Mayan villages in the surrounding mountains. The easiest way to visit the villages is in a day tour from San Cristóbal. Plus, a good guide will help to give you a deeper understanding of modern Maya life. San Juan Chamula and Zinacantan are the most well-known (and visited) Maya villages, but there are others, such as Tenejapa and San Andres Larrainzar, that are equally as fascinating, and they receive very little tourism. The best day to visit the Maya communities are during their weekly markets and festivals. Stroll around town, enjoy the environment, lovely buildings, café, restaurants, churches and squares. After the Zapatist movement came out of the jungle in 1994 a great load of NGOs came over to San Cristóbal. Nowadays you can find lots of interesting projects in any field really. The list of NGOs working in San Cristóbal and its surroundings is quite long. San Cristobal Language School, . Before and after the Zapatistas, the owner has been here working with and for this community. Nataté works on sustainable projects in San Cristóbal and within the state of Chiapas. Nataté works in different fields: Education, Water and Waste Management (dry toilets, water filtering), Reforestation, Construction, etc. Short and long term projects are available. 'FrayBa  sends Human Rights Observers in Zapatista communities. People should be aware of cultural issues in this region. While San Cristóbal has done a great job of cleaning up, there is real destitute poverty just around the corner if you scratch the surface. The native people suffer a lot so please respect them and treat them with kindness when you come into contact. VIVA (Voluntariado Internacional Voluntad en Acción) vivavoluntariado.org works with locals, indigens and sustainable projects. San Cristóbal is also a popular destination for travelers who want to learn Spanish. Buy colorful handicrafts in the market. To get your quality leather products (bags, purses, rucksacks, belts) custom made, go to Talabartería Ballinas where Vicente Hernández will exercise his excellent handicraft skills for you. Av. Presidente Portes Gil # 8A, Col. Revolución Mexicana (from the centre take Flavio Paniagua East and turn left (North) along Huixtla and it's several blocks on, on the left-hand side). Tel (67) 8 95 42. Near the crafts market there is a handicrafts cooperative with authentic goods from the surrounding villages. The prices are a good deal more expensive, but you'll be getting the real handmade goods. East of the Parque Central, following Real de Guadalupe, is a complex called Tierra Adentro  which sells Handicrafts, T/shirts, Posters etc. in a cooperative which helps the autonomous communities of the Zapatista movement. Jolom Mayaetik the weavers coop is located approximately 2 kilometer up the road that connects the city of San Cristobal de las Casas with the municipality of San Juan Chamula. The most recommended method of transport is to get a taxi from San Cristobal. The maximum price from any point to Kinal Antsetik should be between $ 25 and $ 30. There is also a van service from the Municipal Market of San Cristobal de las Casas, next to the Santo Domingo artisan market. This van will have "Market-San Ramon-La Quinta" printed on the front of it. After leaving San Cristobal you will need to stop at the blue and white church called “Ermita.” From there walk to Antsetik Kinal Center. The van costs 6 pesos per person. El Gato Gordo - Real de Guadalupe 20. Good restaurant with live music. It has a cheap vegetarian menu for 35 pesos (soup, rice, cheese croquets). Pasta is also +- 35 pesos. El Caldero - Enjoy some hearty traditional Mexican soups. Prices are 49 pesos for any of the soups and the menu also includes salads and few other snacks. Located on Insurgentes about two locals next to Toluc. El Tacoleto - Some friendly and attentive wait staff, serving mexican tacos and quesadillas. Lacking any Chicken tacos but other than that everything is great. Very clean places and quick service. right across the street from Latino´s night club on Francisco Madero. El Mesón del Taco - Av. Crecencio Rosas Tacos al pastor, quesadillas and other Mexican food. 40-50 pesos. Quesadillas de Lupita - in the street in front of the San Francisco market for sweets and handicrafts (Av. Hermanos Domínguez), third entrance on the left side, evenings from 8:30PM only. Different food every day, made with a lot of love. El Molcajete - located in front of the Law School heading towards El Carmen Church on the pedestrian street. Known for its delicious Pozole a traditional Mexican meal. resonably priced and filling. La Casa del Pan - Two Locations both with restaurant and bakery. The original La Casa del Pan is in the Barrio del Cerillo, known for the fountain in front providing a perfect outdoor sitting area. The second location is on Real de Guadalupe # 55 in a building offering a cinema, bar, language school, yoga and few more activities. La Casa del Pan is know for its quality baked goods as well as the organic products used in the restaurant and sold in the store. A nice selection for vegetarian and more health conscious visitors. Panederia Dona Isabel. Address: Real de Guadalupe 22, Zona Centro. Amazing bread! Go to the main public market and eat tamales for breakfast. Another local specialty is "sopa de pan" which you will probably not find in any restaurant catering to tourists. You will find it in the comedors int he market. That is the best food in town. At certain times of the year different insects are consumed in different ways. Pay attention in the market and you might have the chance to try something really exotic (to you). A lunch time bargain is in the different cantinas. These are family places and I am not telling where any of them are, you will have to figure that out on your own... order a beer and you will get a little plate of food to go with it.. house choice. Its cheap and excellent, though, you might get drunk in the process. Most all restaurants serve filtered water. The local drink here is "posh" or pox. It is a hard liquor made from cane and has been used traditionally for healing and partying. It is frequently served in ponche -- a pineapple or fruit hot punch with a special bread broken into it. Perfidia , María Adelina Flores and Cristóbal Colón, 3 blocks east from the cathedral. A good space to relax and listen to great music, get the party started with a few tequilas, mojitos, or other cocktails, or visit a local art exhibition with a diverse mix of people who live in San Cristóbal. It's the best spot for tourists to really interact with locals and the many people from all over the world who have come to San Cristóbal and decided to stay. The bar occupies a beautiful old house, which is registered as a historical landmark, with three different rooms, each with a different feel and decorated with elaborate stencils by a local artist, and a garden patio (which is beautiful at night). Perfidia has many great specials, including pitchers of Mexican beer for only 50 pesos and 2-for-1 drink specials until 9 o'clock, way past normal happy hour, free live music and exhibitions, and very cheap, gourmet Mexican bocadillos (snacks). In April 2008, Perfidia will start salsa lessons with a very popular teacher (from when the space used to be called La Pera). And on May 31, 2008, Perfidia will feature the gallery opening "Intercambio Frontal. La Paloma restaurant on the walking street. Has nightly music and is a nice place for the older set especially. Cafe Toyol Witz (Calle Comitan 10-B, Barrio del Cerrillo) for a Fair Trade, shade grown cup of coffee that is beat by no other check out this local cafe that doubles as the first floor of the owner's home. Slightly off the beaten path to the city center, you'll find the cafe keeper to be more than willing to help answer any questions you may have about the coffee or neighborhood. Also nightly there are many bars with music on the same street; La Revolución (or El Revo), El Circo etc. On Insurgentes, not far from the wonderful restaurant, Madre Tierra, there is a jazz club. Most of the music is performed by local musicians in the clubs and restaurants. On the corner of the zócalo in the Santa Clara Hotel/bar there is music in the evenings. La Garita Cabanas Address: Calzada de la Quinta 82, La Garita, 29230. Phone: 01 967 114 0700 Location: La Garita is a local (not touristic at all) and quiet north district of San Cris. It is 15 minutes by walk or 5 minutes by $6 colectivo from the center. Services: Common kitchen and hot water between 8-11am. Cheapest price: $150 for a two person chalet. La Garita Cabanas is the perfect place where to stay if you like nature and relax. It has the best view over the town where you can admire charming sunrise and sunset. Posada mi casa Calle Ejercito Nacional 14. Barrio el Cerillo. Tel (+52)(967) 673 03 77. Hostal El rincón de los camellos , Tel: (+52 967) 116-0097, Real de Guadalupe 110 circa Vía Guerrero, Dorms from 70 Pesos. Hostal Plaza Central, Calle Bonagua 2B, dorms from 50 Pesos. "'Hostel Qhia'", Calle Tonala 5, dorms in high season 100 Pesos. Has nice sun terrace, good views over the hills surrounding San Cristobal, free breakfast and wifi, organises tours, very close to the main market, very clean. Try to book in advance in high season as it gets very busy. La casa di Gladys Address: Av. 5 de Mayo n°47, Phone: (967)67888733 The spiritual camping/posada in San Cristobal. Centraly located (two blocks from Santo Domingo Church and market), nice, clean, safe, relac atmosphere. Hammocks in a cozy garden, hot water, guest kitchen, movies, music and cable tv, tours, massages and Osho Meditation. Economic private rooms. Breakfast included. Hotel D'Monica,--Avenue Insurgentes 33; about 2 blocks up from the bus station towards the town centre. Pleasant rooms, a beautiful garden--about $35-40 per night--not cheap, but not over the top, either! Belen Posada - Plaza de los Mexicanos. Wonderfully charming, this mid-sized inn has very reasonably-priced rooms starting at M$275 for their basic double up to M$450 for larger rooms. The spacious, carpeted rooms all have WiFi, TV's, sturdy furniture, and private bathrooms decorated with colonial-style tile and hot water. The prices for the cheaper rooms makes it hard to call this 'mid-range', but the amenities make it hard to call 'budget'! 'SOLYLUNA Guest INN.,--Calle Tonala #27, Barrio Cerrillo, nestled high on a hill within walking distance from the center, 7 minutes, 3 minutes from Santo Domingo and 3 minutes from the wonderful mercado, one finds Sol y Luna. Filled with lush patios, decorated with an eclectic collection of Mexican and world art one is right at home with the warmth and kindness of owners Dani and Cisco. Amenities include, free WIFI, cable TV, and a free breakfast. Rates are from $50 to $85 USD per night! Holiday Inn, Calle 1 De Marzo 15, Zona Centro, +52-967-6780045, . Just a couple of blocks from the center of town. About $100 U.S. per night. Most colectivos depart next to the ADO bus terminal. A colectivo to Tuxtla costs approximately $50,-. There is no direct colectivo to Chiapa de Corzo, instead you take one to Tuxtla, the driver will drop you off at the junction to Chiapa. From there you can take a local colectivo downtown, or walk. A tour to two of the local indigenous villages, San Juan Chamula and Zinacantan is found at 9:30AM at the plaza in front of the cathedral, next to the Zocalo. Cesar and Raul are always there and everyone who appears is accommodated. They speak many languages and this visit really needs a guide, so you understand the interesting things you will observe. They supply transportation and entrance fees. The tour returns around 2:30PM (lunch time in Mexico). In 2019, this tour cost 250 pesos. [www.alexyraultours.wordpress.com]. Alex has set up a tour company called Cielo y Tierra Tours that offers private tours to Chamula and Zinacantan as well as several of the other more remote Maya villages, including Tenejapa, San Andres Larrainzar and San Pedro Chenalho. There's information about all their tours on their website. Private tour for two costs $750 MXN (pesos) per person. [Cielo y Tierra Tours does not operate anymore]. El Arcotete - The Arcotete is one of San Cristóbal´s best kept secrets. Similar to Rancho Nuevo but much nicer and closer to San Cristóbal, located about 5-10km from the City in the direction of Tenejapa (signs are well placed to find El Arcotete). 10 pesos per vehicle. Recently remodeled into a park offering nice walking grounds surrounded by Pine trees, picnic areas, and nice look out vantage points. A great day trip to spend a couple of hours or the whole day enjoying a picnic or a pickup soccer game. It costs 5 pesos to enter the part of (Las Grutas) The Caves. El Arcotete will provide a wonderful experience enjoying Natures work at best. Check it out for yourself. Orquideas Moxviquil - Periferico Norte #4 Barrio Ojo de Agua, San Cristobal de las Casas. 9 till 16.00 daily. 6785727. A beautiful botanical garden 1.5 kilometers from the town center. For a small entrance fee one can enjoy over 400 species of native plants all that have been rescued by the founder Cisco. In 1994 Cisco began a campaign to rescue a few of the discarded plants that he found on his wanderings through Chiapas. The collection has now grown to over 20,000 rescued plants, all from the forests of Chiapas. The grounds have beautiful areas to rest and meditate, large bodies of water and wetlands, walking trails, a growing collection of sculptural art and two beautifully designed greenhouses to highlight plants. 1. from the "Tierra Caliente" and 2. plants from the Lagos de Montebello. Be sure to bring a camera. Come and enjoy! El Chiflón - El Chiflón is a series of waterfalls and pools reminiscent of Agua Azul or Semuc Shampey a few hours from San Cristóbal. To get there, take a bus or van to Comitán (1.5 hours, 60 pesos), and another van heading to Socol or Tuxtla and ask to be let off at the entrance to El Chiflón (40 minutes, 35 pesos) - it's just 1km from the road to the entrance. 30 pesos to get in, it includes a small museum explaining the formation of the river, a space to see iguanas, campsite, and some amazing vivid blue pools to bathe in. The trail itself is fairly short, a little less than 1.5km, but at the end you have an amazing view of a huge waterfall, Velo de la Novia, which definitely makes it worth your while. There are some small ziplines across the river as well, but the place has a much less touristy feel than Agua Azul, mostly it's frequented by Mexican families. Tours of el Chiflón cost 350 pesos (July 2013) and include the Lagos de Montebello. Laguna Miramar - Visit one of the most beautiful lakes in the Lacantun Jungle in the south of Chiapas. Visiting Laguna Miramar requires planning and organization. It is inside Zapatista territory. Do not attempt to go there without a guide. Do bring everything you will need, there is nothing to buy there. Canon del Sumidero - This is a worthwhile half day trip from San Cristóbal. On the way there visit Chiapa de Corzo. El Chorreadero - Nice waterfalls with small natural pools where people can take a swim. You can check out the cave where the waterfall is born and then follow your way down. In the very last pool people can practice naturism. To get there take a van from San Cris to Tuxtla Gutierrez and ask to be left in Chiapa de Corzo. Under the bridge look for collectives or taxis direction Bochil and that will leave you close to the waterfall entrance. Oventic - From the northern part of the San Cris market you can take a van that leads to Oventic. The combi (~1 hour, 35 pesos [April 2015] or shared taxi for 43 pesos [September 2016]) only leaves when it's full, and not a lot of people are going in that direction, so expect a bit of a wait. It's a bumpy and winding road up the mountains. To go back to San Cristobal, just hail one of many shared taxis that would take you back to the market. It also costs 43 pesos per each ride. Oventic is a caracol or independent zapatista community where they have most of their administration buildings. Bring your passport or official documents. People at the entrance will ask you questions to evaluate if you would be allowed inside the place, expect a wait. If you are allowed in, a guide will walk you through the community. You may take pictures of the very nice murals but not of any people. The guide will not be able to answer any of your questions. There are three gift shops and its considered polite to buy the handicrafts to help support the community. They also have a small restaurant near the entrance which may or may not be open. Close to the town of san Andres which is also worth a visit. Lagos de Montebello - A series of picturesque lakes near the Guatemalan border (20 pesos). The lakes are rather far apart (~5 km between each one), making it difficult to walk them if you're alone with no car. A tour that includes el Chiflón costs 350 pesos (July 2013) from San Cristóbal. If you want to do it alone with no car, you can take a combi from Comitán (1 hour, 40 pesos) that leaves from the same place as the combis from/to San Cristóbal and el Chiflón, and then try to hitch rides from other tourists in the parking lots or walk back to the highway after visiting each lake and wait for the combi to pass again to take you to the next entrance for 10 pesos. Palenque - The Palenque ruins are a beautiful Mayan site, one of the largest mayan ruins in Mexico. It is worth a visit, however, the ruins are 6 hours away from San Cris, through the mountains. Many tour companies arrange visits for a couple hundred pesos. Be warned that the road has over a thousand curves and just as many speed bumps. Bring dramamine and plenty of water; most tour companies will provide you with a plastic bag in case you vomit. Should you simply have nausea, consider buying some Bonadoxina at the local pharmacy. As always, check with the pharmacist regarding your specific symptoms and potential allergic reactions. This page was last edited on 3 February 2019, at 07:52.